Awhile back I made a post about purchasing a new muzzy. I haven't used a muzzleloader since I was a little kid. I wasn't sure what I wanted exactly and got some good feedback. Robby contacted me and asked if I was interested in using the Cooper 22ML he had been testing since he didn't draw any muzzy tags this year. I still didn't know exactly what I wanted so I was more than happy to take the Cooper 22ML for a test run this season. 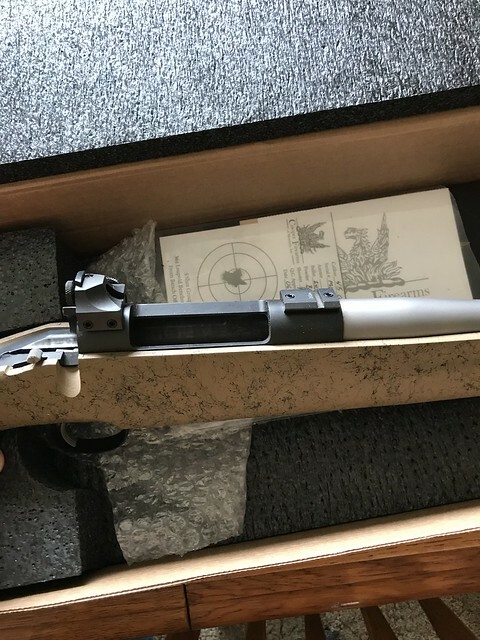 I received the gun a few days ago. Robby had sent it back to Cooper to get the ramrod guide fixed. Cooper fixed that and sent it to me with a NECG peep installed and a hooded front sight. I swapped the peep out for a 3.5-14 Leupold I had sitting in the safe. 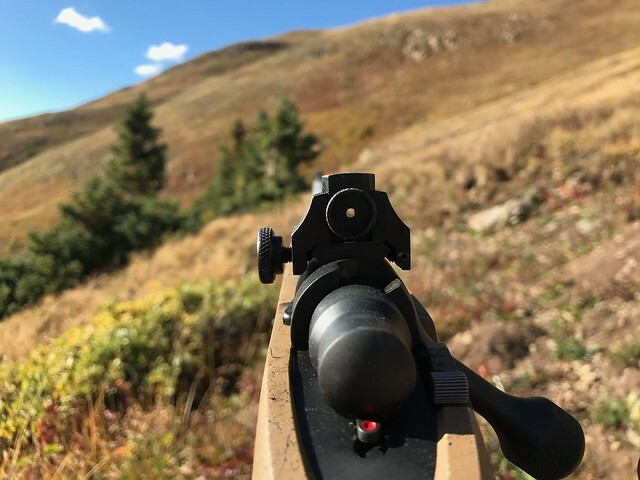 I left the front sight on since I am only using the scope for load development. After that I took out the front stud so I could install the mount for my Javelin bipod. 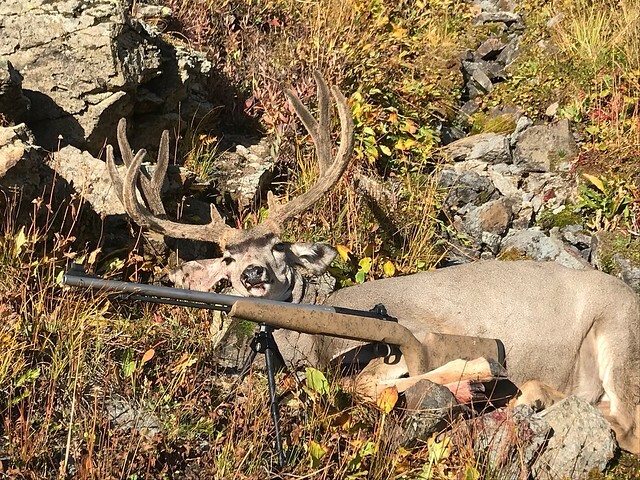 There isn't much for components here locally when it comes to muzzleloading. I grabbed what was available which wasn't much. Season starts in about a month. Sabots aren't legal in Colorado so I'm going to concentrate on finding a good load with a conical first. I got out early this morning before work to get it sighted in and test a load or 2. 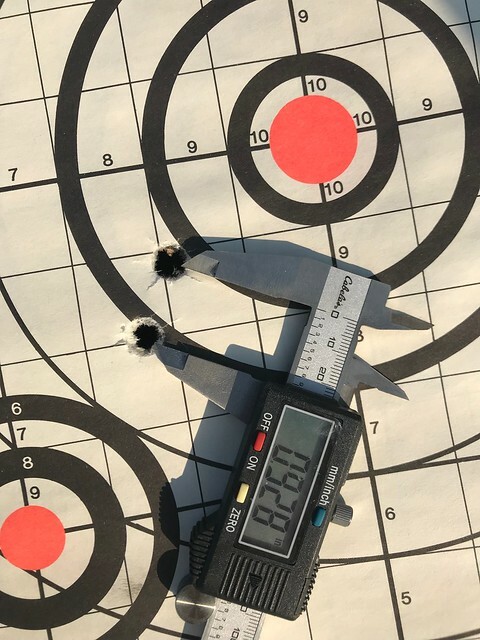 I set up the target at 60 yards to get it on paper. 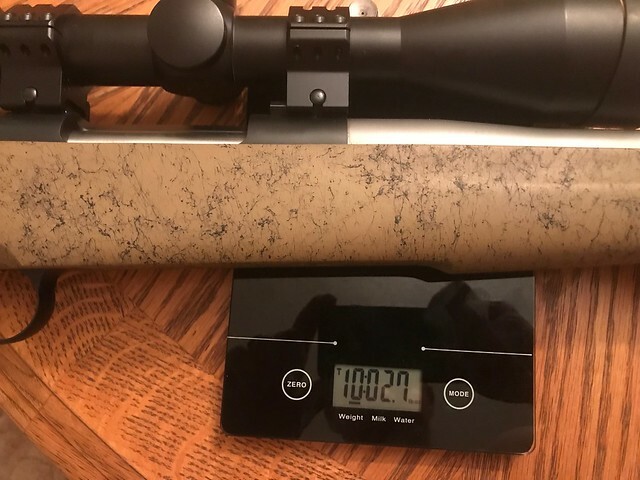 After bore sighting I loaded it up with a CCI 209 primer, 100 grains of BH 209, and a 195 Powerbelt. 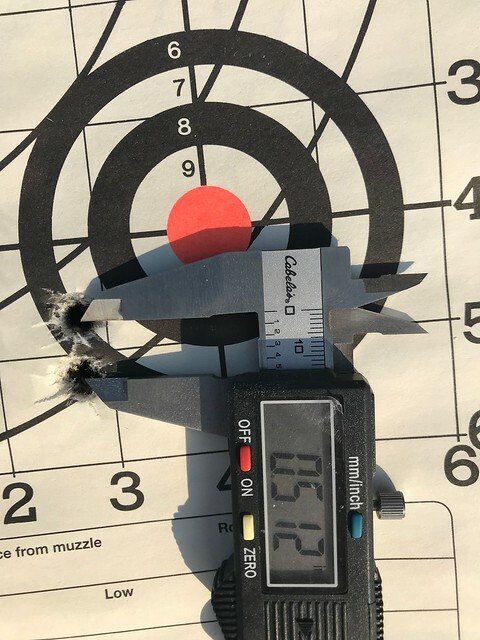 The first shot barely caught the top of the target so I adjusted it down 10". Next shot was close enough so I backed up to 100 yards. 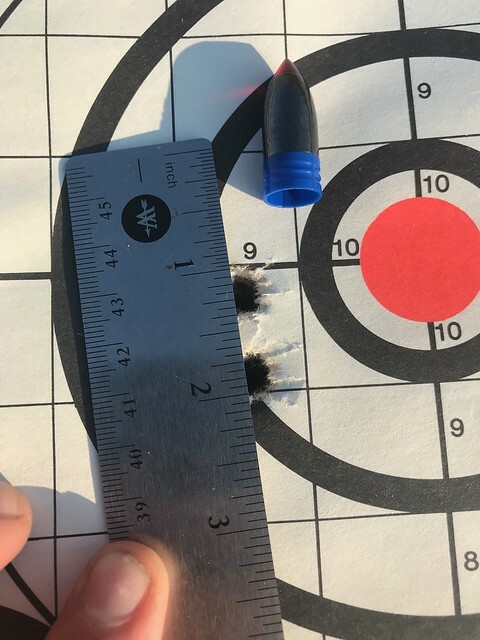 Here is my first group at 100 yards. I used the same load that I used to sight it in with. CCI primer, BH 209, and a 195 Powerbelt. About 1.625" group. Next load was 110 grains of BH 209 with the CCI 209 primer and the 195 Powerbelt. That group was about 1.8". Next I loaded up 120 grains of BH 209 with a CCI 209 primer and the 195 Powerbelt. That grouped just under an inch at about .94". 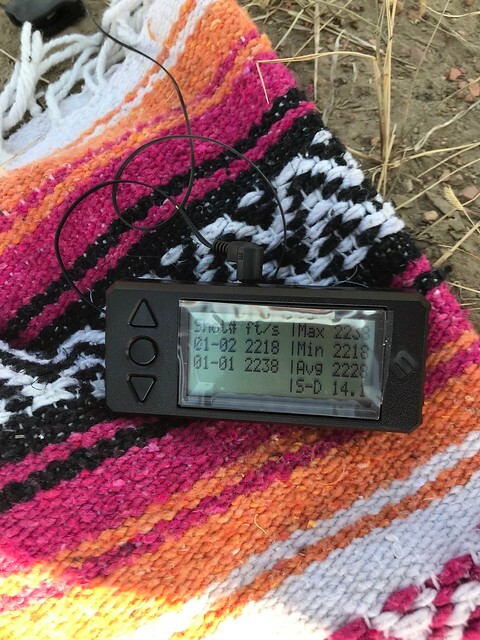 The wind had started to pick up right after I moved out to 100 yards. So I didn't get in as much load work as I wanted since it seemed to be getting worse and worse. I came home and cleaned the gun then went to work. Hoping to get out again in the morning and test some more loads. After shooting it and handling it the little bit that I have, I really like the stock and trigger. 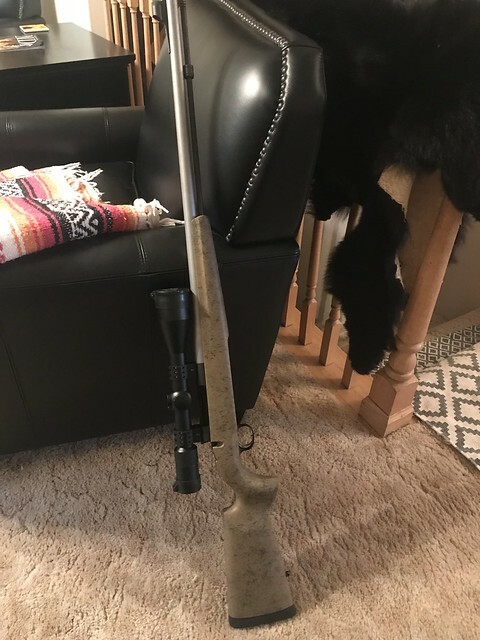 After only ever using a side lock when I was a kid its a nice surprise to shoot a muzzy that feels like a regular modern rifle. 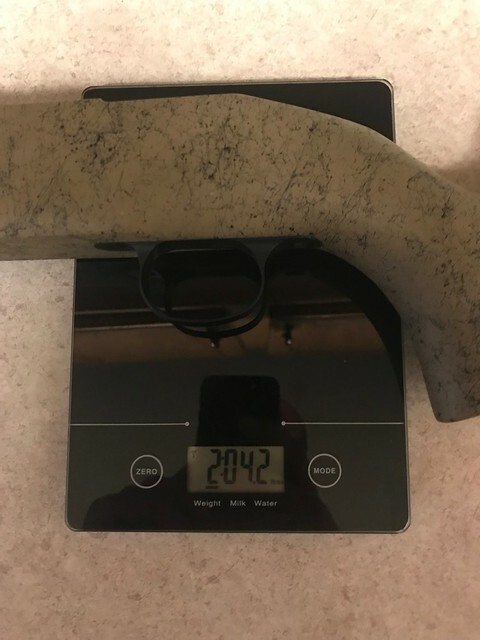 if you get a chance would you weigh the rifle as you have it equipped for shooting... Wouldn't mind knowing the weight of the stock either? 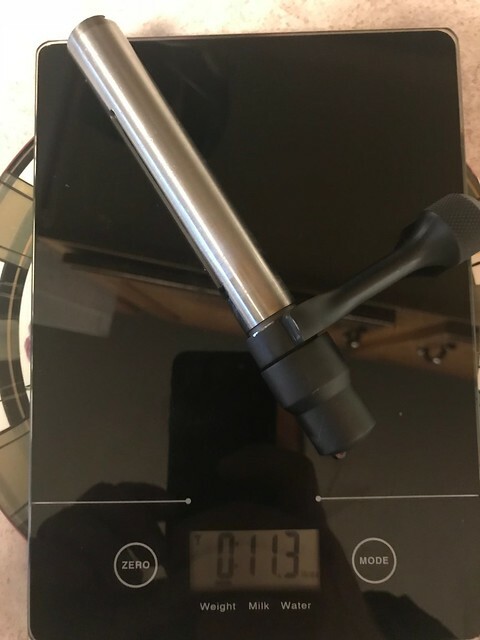 Yep I'll weigh it as is. Once I swap the scope for the peep I'll take it apart and weigh each piece individually. I got out again to shoot before work this morning. Probably my last shooting session for a few days because of work. 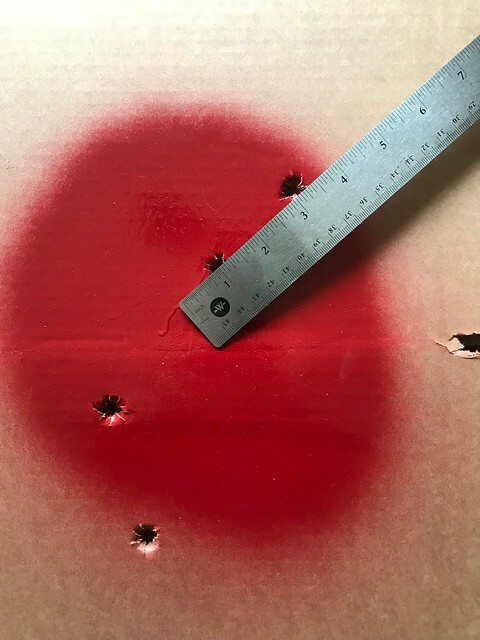 Here is a pic of my "range"
I fired a fouler shot then loaded up 100 grains of BH209 with the 250 grain Aerolite and a CCI 209 primer. 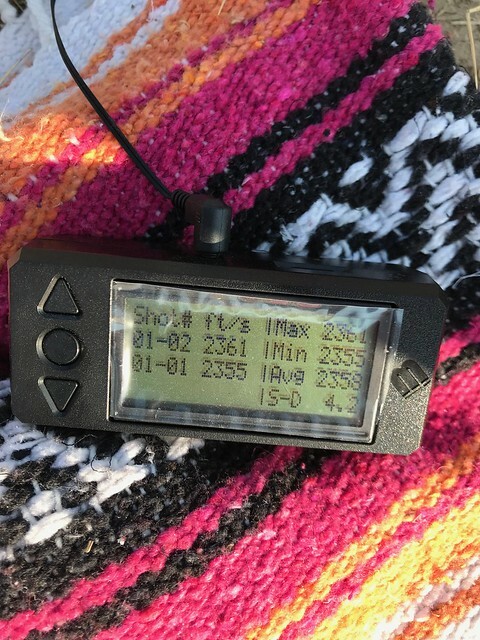 I was pretty happy with that group at 100 yards. 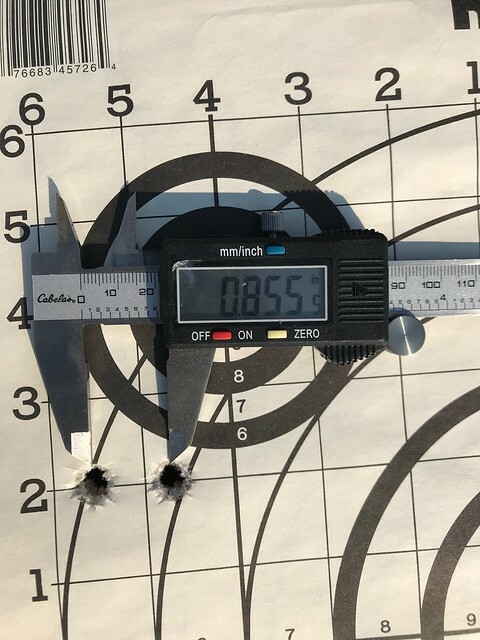 About .69"
Next load was 110 grains of BH209 with the 250 Aerolite and the CCI 209. 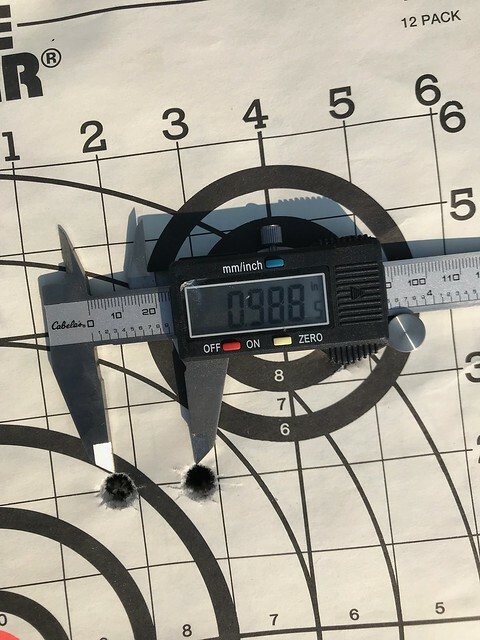 About 1.25"
I loaded up 120 grains of BH209 with the 250 Aerolite and a CCI 209. 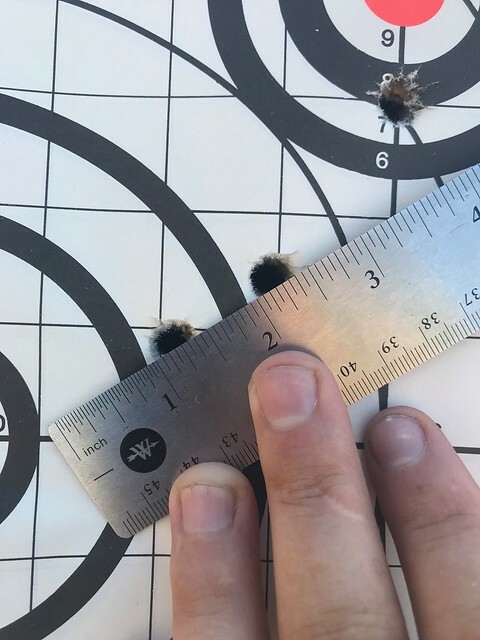 This group was about 1"
Overall I was pretty happy with this bullet, powder, primer combo. 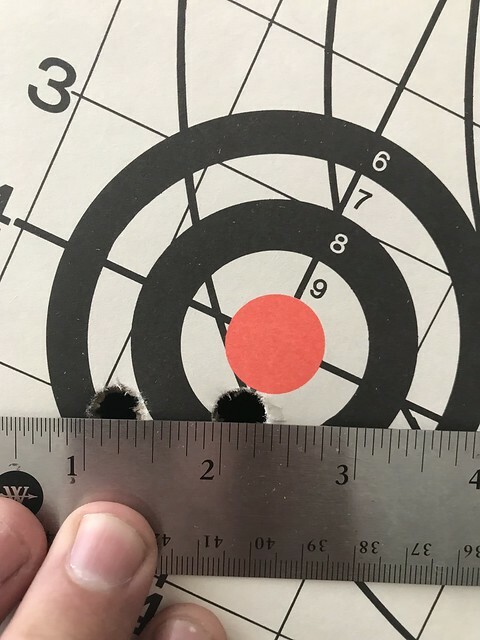 I didn't feel like I pulled the shot bad during the second group, but it is a little curious that it is the only shot out of both shooting sessions to the right of the bullseye. I might reshoot that load just for curiosity sake. Since time is limited before the hunt I'm thinking of just checking drops and velocity with this component combo. Then swap the scope for the peep and shoot the peep and get comfortable with it. I'm pretty impressed with how accurate this gun is. 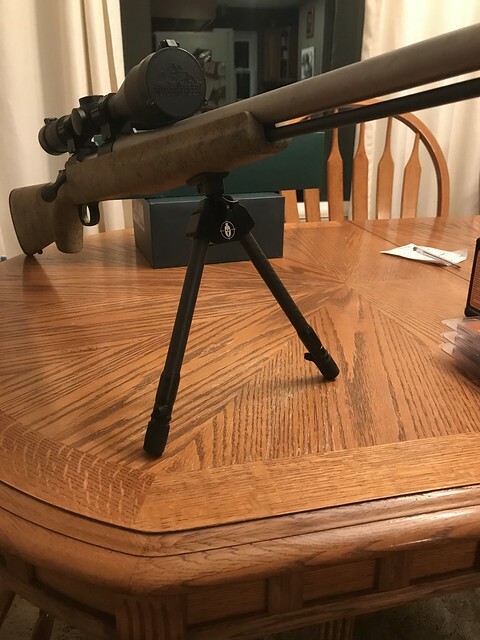 I'm not familiar with modern muzzleloaders, but for a guy like me that hasn't been around muzzleloaders for 20 years this Cooper is sure easy to shoot. 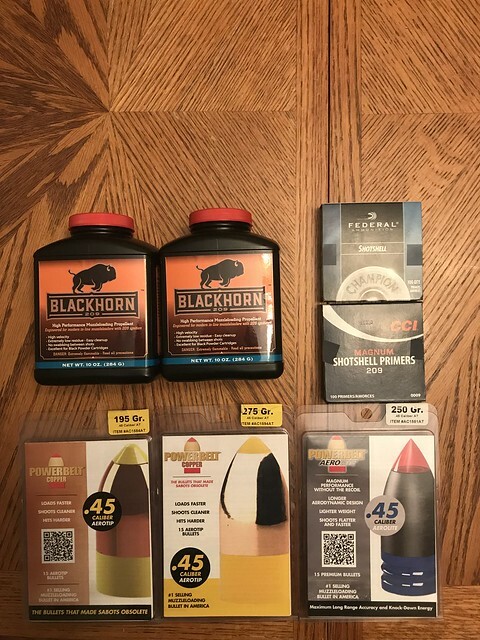 Both bullets I have tried with only 3 different powder loads shot 1" or better. That's better then one of my modern rifles I have in the safe. I weighed the gun last night. 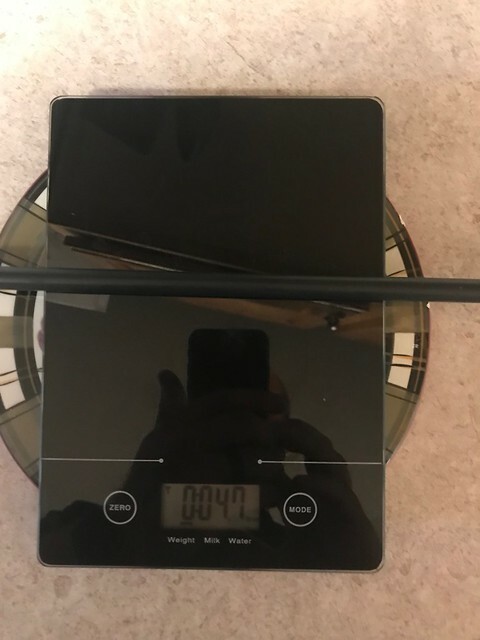 Just under 10lb 3oz. 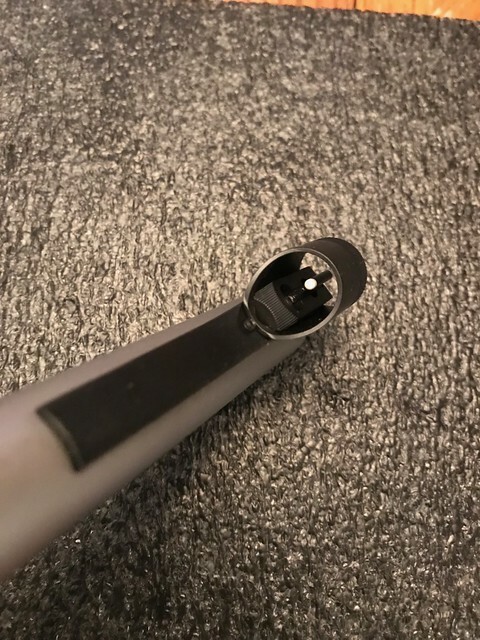 The scope is a 3.5-14X50 Leupold with Weaver rings. I've been working dark to dark so I haven't had a chance to shoot it again this week. Possibly this weekend but I have 2 jobs tomorrow already so it will probably be Sunday. Got out again this morning. Had to make it early since its supposed to be 104 today. It was a little breezy so I just brought the chrono and stuck to 100 yards. 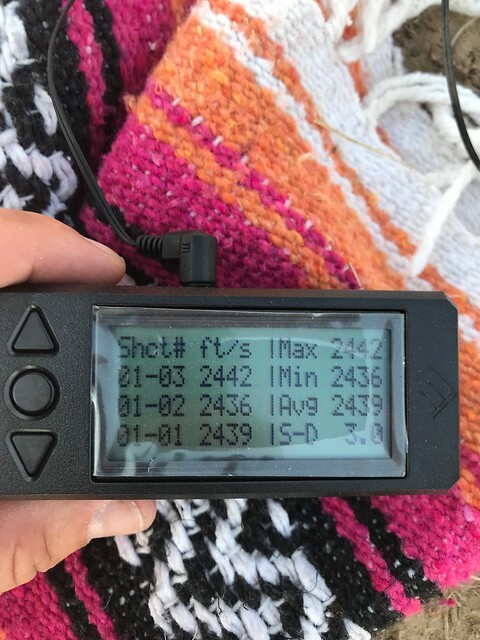 I decided to shoot the best load last time with the 195 grain powerbelt, which was 120 grains of BH 209. Then I also shot the 250 powerbelt with 100, 110, and 120 grains of BH 209. Here is the load with the 195 Powerbelt. First shot was the fouling shot. 2439 is a lot faster then I was expecting. I was thinking it would be around 2200 fps. Then onto the 250 Powerbelt with 100 grains BH 209. This load has been really good accuracy wise both times I have shot it. Here is 110 grains of BH 209 pushing the 250 Powerbelt. Here is 120 grains of BH 209 pushing the 250 Powerbelt. Overall it was shooting faster then I expected. And the accuracy continues to impress me. I think I am done shooting with the scope. I am going to swap to the peep and get it sighted in. After seeing the chrono results I'm not sure exactly what load I'm going to go with yet. I would like to be able to hold dead on as far as I can accurately shoot the peep. 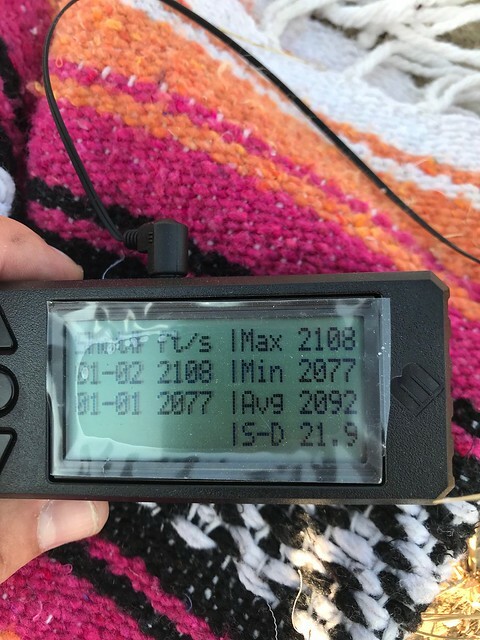 I'm guessing my max range will be 150-200 yards. Won't know until I see how well I can shoot the peep. 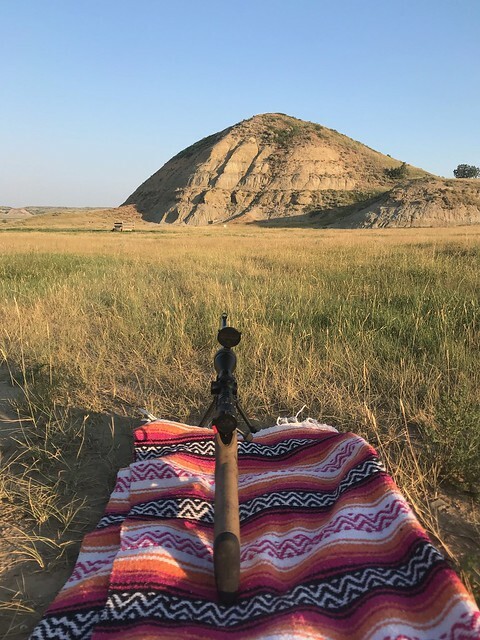 If I sight in at 150 yards with the 250, I would be about 2" high at 75 yards, and 4.5" low at 200 yards. I could almost hold dead on out to 200 yard which would be nice. Great report. Looks like you have plenty of options. 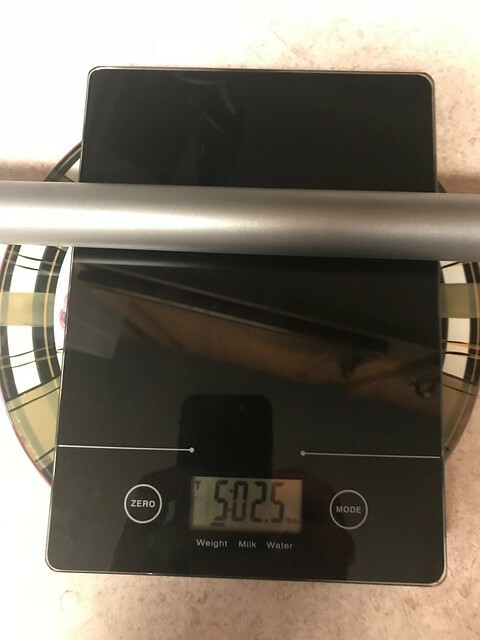 I took the gun apart tonight and weighed what I could. Work finally slowed down enough for me to get out and get the peep sighted in. I fired a fouler at about 40 yards to make sure we would hit the target with the peep and moved back to 100 yards. 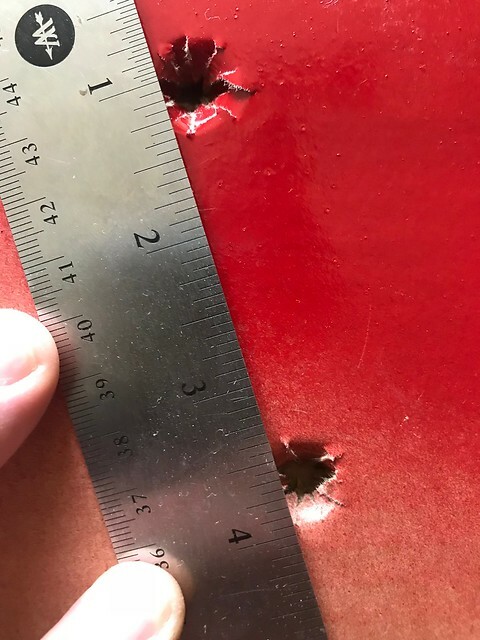 It was a little tough because the front post and bead covered up most of the target at 100 yards. After half a dozen shots and over adjusting the windage I left it and fired for a group at 100 yards. They were ok so I backed up to 140 yards and shot one from there. 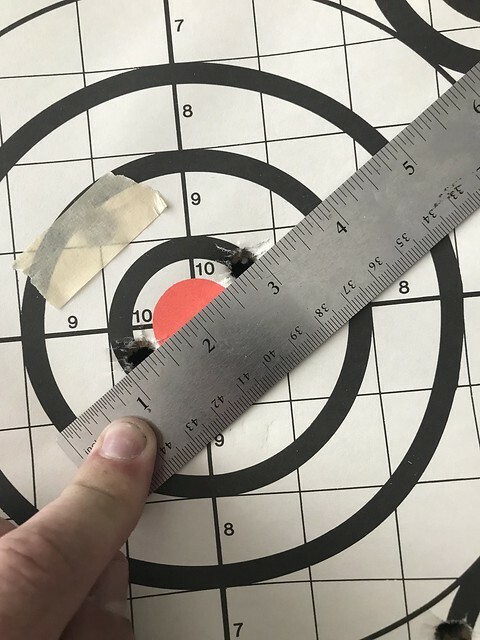 Right edge of bullseye is my first shot at 40 yards. Upper 2 shots were at 100 yards. Middle bullseye was 140 yards. After the shot at 140 I left. 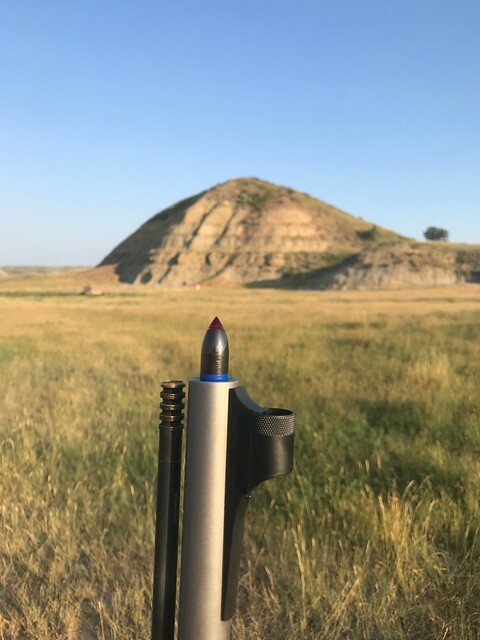 I always like to leave stuff on a positive note so I don't have to second guess what was wrong until I can shoot again. I went out again this morning before work. It was raining and I was short on time so I only shot 5 times. First was just an off hand fouler at 85 yards. After that I moved back to 150 yards. I figured I would fix the issue I had with the post and bead covering up the target so I spray painted a decent sized circle. 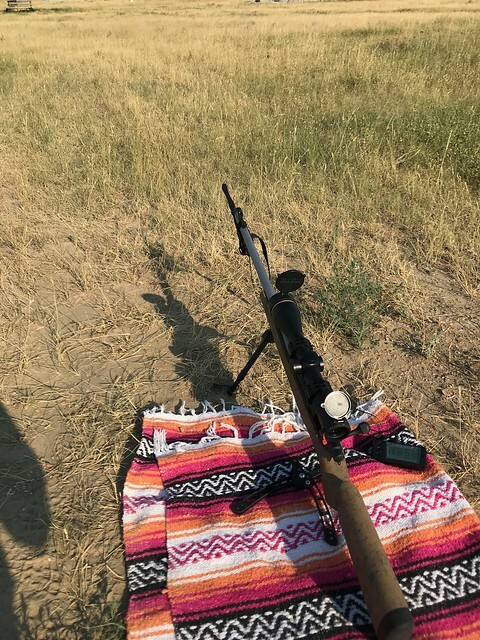 It didn't really help much at 150 yards. First shot I knew I pulled when I shot. Second shot felt good. 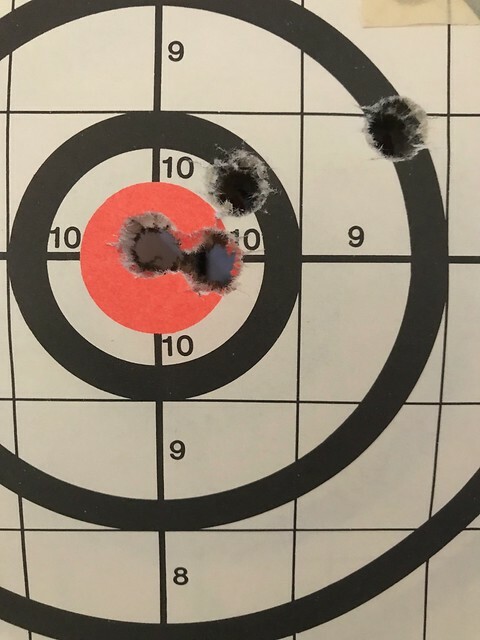 Upper right is my first shot at 150 yards. Next shot at 150 is just down and left. Next I backed up to 200 yards. 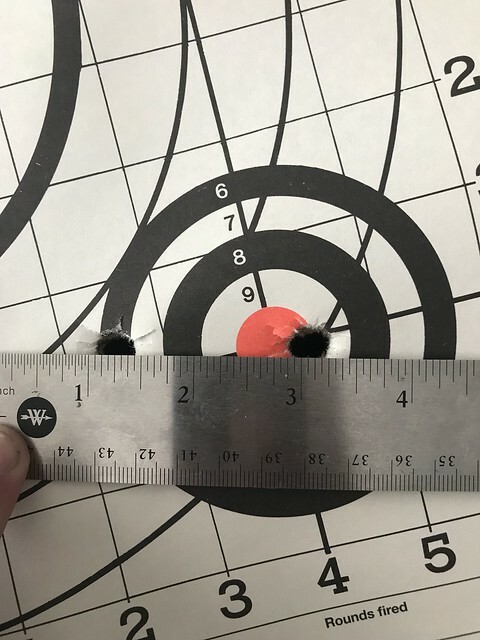 Since I was consistently shooting slightly right I adjusted the peep just a tiny bit left. 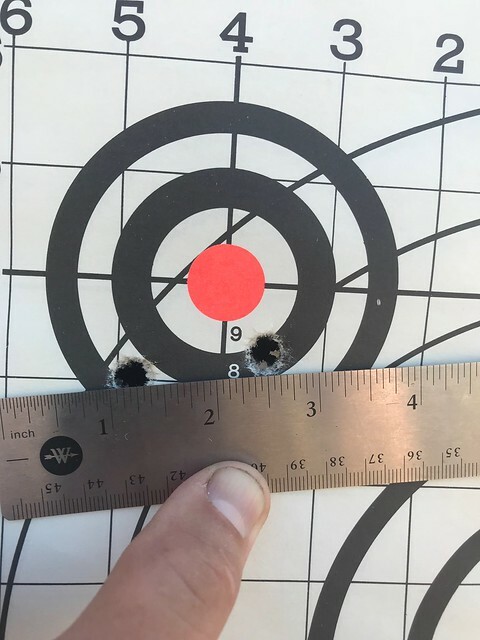 The bottom 2 shots are from 200 yards. The gun is obviously really accurate even with me behind the trigger. I feel like I could shoot it even better with a modification to the front sight. Overall I'm happy with the load and how it is shooting with the peep. This is 120 grains of BH 209 pushing the 250 grain Powerbelt at 2356. Well the Cooper and I got it done in the high country. It was a tough hunt and didn't go the way I had laid it out in my head. But most of them don't go the way I plan them anyway. First area I hiked into I couldn't find a deer. Second area had some deer but also a lot of hunters. I missed a buck on the third night of the hunt. It was a frustration shot I shouldn't have taken since I didn't feel I had time to range and shot right over its back. Afternoon of the fourth day I spotted this buck with a 2 point. 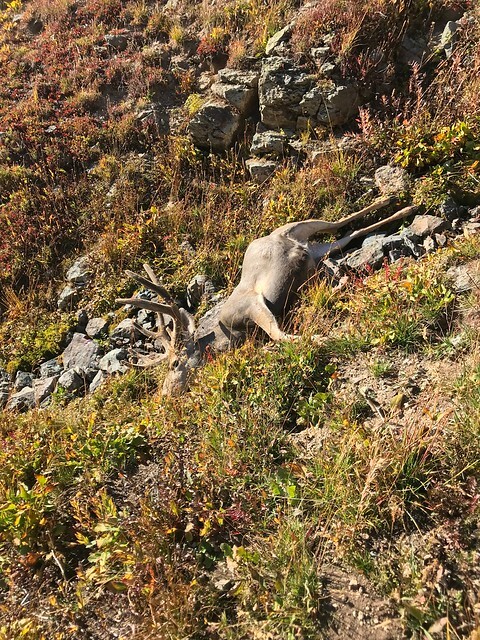 They ended up bedding in a spot I thought was fairly stalkable and if I did kill the buck I figured it wouldn't roll that far. On the second night of the hunt I passed up a stalk on a couple really nice bucks because it looked like they would roll 1500'-2000' if they were killed where they were at. After stalking the bucks the bigger of the two fed out quartering towards me from behind those trees. I got way closer then I meant to. It was a 14 yard shot. Here is how I found him about 20 yards below the patch of krumholts. Got a few pics of him, then cut him up and packed it out. Great buck! Way to get in there close and get it done! Wow, this is a sweet thread! Sorry I’m late to the party. That is so funny you got that gun almost driving tacks and then kill the buck at 14 yards!!! Hahahah. Super job and I’m so glad you took the Cooper project on. I couldn’t have done a better job if my life depended on it. 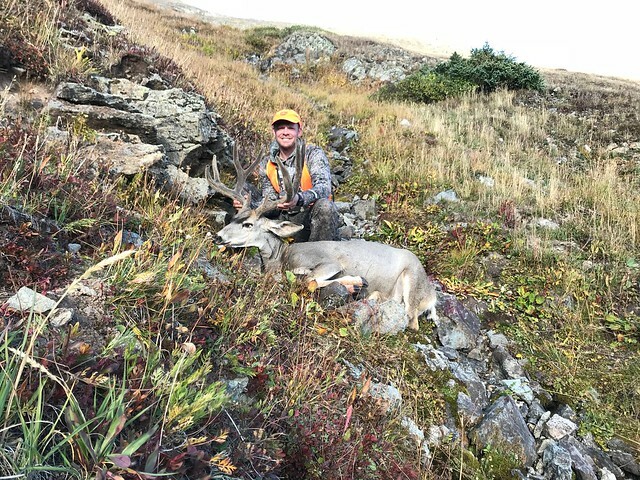 Great write up and great hunt. Way to stretch out the Cooper to the MAX!!!!! Branden's final review is complete. Man...this is making me want a new muzzleloader. Good write up!